Ushaw Moor Colliery / Broompark colliery. I found this article very interesting.Last paragraphs mention broompark, but also interesting to note that both Broompark and ushaw moor collierys opened at the same time. USHAW Moor is a former mining village on the north side of the River Deerness, half way between Durham and Esh Winning. Centrally located among the mining communities of the Deerness and Browney, roads from neighbouring places converge upon a crossroads at the village centre. Farm, half a mile west and Broom Hall on a hill to the east. Century when Ushaw College opened, but this famous institution existed half a century before Ushaw Moor itself. There had been an earlier farming settlement called Ushaw, first mentioned in 1312. Now gone, it was possibly located where College Farm stands. college now stands. It was a communal establishment used by the poor and needy for a small fee. places such as Esh, but in 1755 attempts to reach coal on the moor ended in failure. In 1858, the Pease family opened a railway through the Deerness Valley to serve the colliery at Waterhouses which stimulated the development of more mines. old Esh and Hilltop. By 1873 it belonged to John Sharp but passed to the aristocratic Henry Chaytor of Witton Castle in 1879. Ushaw Moor’s first colliery village developed on the north side of Cockhouse Lane (the B6302), three quarters of a mile west of the present village. Deerness. The colliery and terraces were demolished in the 1950s and 1960s and are now empty fields. village lay in the fields to its east. There had been development of buildings around the crossroads in what is now the centre of Ushaw Moor before the 1890s. Buildings included a pub called the Flass Inn, but the population was concentrated in the terraces further west. Cockhouse Lane leads to Esh Winning and Waterhouses, but before those collieries developed it terminated at Flass Hall, a mile east of Ushaw Moor. The hall’s name derives from an Old Danish word, Flask, meaning swamp and has the same meaning as Flass Vale in Durham. Established in the 1570s, it lies on the site of a medieval farm and is marked on Saxton’s map of Durham in 1576. The hall’s first occupant was William Brass who was succeeded by his son, Cuthbert in 1600. The last Brass at Flass still lived there in 1697 when it became the hall of the Hall family. By the 19th Century, Flass belonged to Jane Smythe, of Esh Hall, who married Sir Robert Peat, a friend of the Prince Regent. Robert had serious gambling debts and probably married Jane for money. Chevalier of Esh village while her property at Cockhouse Farm was leased to John Leadbiter of Gateshead. resident, if indeed there is one, remains a mystery. 1960s, it belonged to the Batmanson family in the later half of the 16th Century. colliery village that developed in the 19th Century. mysterious medieval moat. The colliery closed in 1904 after a major fire from which the miners escaped by means of an old drift. a Durham coal owner who owned a brick foundry. He is thought to have built the pub with his bricks, each perhaps inscribed with the word Love. * In next week’s Durham Memories we look at the troublesome history of Ushaw Moor Colliery. email David.Simpson@nne.co.uk. All photos will be returned. I seem to be in the dark a bit where the site is concerned with Twitter and Facebook now available on the web site as I am not familiar with these systems. I have been going over the site and one name Sheila Hall caught my eye and her memories. Is this Sheila Harrison that lived in Hall Avenue? It is now many years since I left Ushaw Moor but it still retains a place in my memories. My first memories of Ushaw Moor date back to January 1947 when the family moved from New Brancepeth to 38 Victoria Court. We were only in the house a couple of weeks when the vicious winter of that year set in. On one occasion after a blizzard overnight the snow had blown in a drift to the level of the bedroom window. It was a time of austerity just after the war but as kids we were more than happy with what we had. Sweets were on the ration and the best sweet shop in the village was Dents the Bakers next door to Stan Watsons. The shops and stores in the village sold everything that a family required. Leisure facilities were two Cinemas, the Empire and the Club Hall, both buildings sadly demolished recently, the Albion Club (the Bush) at the bottom of Station Road and the Big Club also on Station Road and the Flass and the Station Hotel. One of the highlights of the year was the arrival of the “shows” or as they say on Tyneside the fair. The show ground was a piece of waste ground situted on the left of the road leading to the railway station. Their arrival created great excitement amongst us kids. The trailers were pulled by huge lorries and just after the war also by a couple of traction engines. It was usually a Friday night when the shows opened and the noise of the music and the generators and the bright lights were magic. There were the usual stalls with slot machines, hoopla, rifles, throw the darts and roll your pennies. There were shuggy boats, roundabouts, Waltzer, Flying chairs and the Dodgems to ride on. The shows were a dose of glamour, noise and music in a very, very austere period of our lives. On one occasion whilst walking to school from New Brancepeth there was the wreckage of an aeroplane on a low loader parked on the same piece of waste ground. It was guarded by armed RAF sentries. I cannot remember whether it was a German aircraft or an RAF plane. Certain shops had their own smells. Winters the Chemists was situated at the bottom of Station Road. Mr Winter the chemist always wore a spotless white dust coat. It was an old fasioned chemists with small wooden drawers with the name of the contents on the front of the drawer. Large glass jars containg ingredients for the medicines prescribed and the smell in the shop was of cleanliness and herbs. There was the smell of fresh bread in the three bakers in the village and the beatiful smell of fish and chips wafting on the breeze most nights of the week from four fish shops. New Brancepeth Co-op Store (Mc Cormicks shop) had different smells for every deparment from the cobblers to the hardware department. Stan Watsons shop on Durham Road had the only two petrol pumps in the village and the pumps were hand operated. Unfortunately the years quickly rolled by and schooldays were finished and the world of work beckoned at the age of fifteen years serving my time as a joiner. 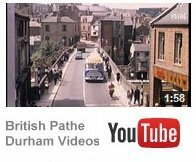 Five years in the Army followed, postings in East Africa, the Middle East and Germany then I left the Army and joined Durham County Police. On the amalgamation of the Police Forces in 1974 with the establishment of the new County of Tyne and Wear I stayed on Tyneside with the newly formed Northumbria Police. Much water has passed under the bridge since I left Ushaw Moor but I think my upbringing in the village turned me into an honest man who is prepared to accept another persons opions and beliefs. Meantime in the last week of December a strike began which was to ensure a sufficiency of incident for the next two years. Westoe, the lodge secretary of Ushaw Moor, was dismissed from the colliery for persistent absence, and for filling dirt among his coal 2 . The dismissal was but the outward sign of a wide- spread dissatisfaction. The owners said that the men had deliberately increased their lost time, at the moment some 23 per cent., as part of a general policy of restriction of output, and that the pit had come entirely under the control of the local union officials, who were men unfit for their responsible positions. The men complained of the general attitude of the manager: he was discourteous, overbearing, violent both in speech and action. In the hearing of Crawford he called the men “a set of lazy b s” 3 . It was an indiscretion he was not allowed to forget. via Full text of “The miners’ Unions of Northumberland and Durham”. Well I thought it was about time I shared my memories of growing up in Ushaw Moor. My earliest memories of growing up in Ushaw Moor consist mainly of Tarzan Swings exploring College Woods and looking for birds nests. As I recall I never was bored unlike a lot of the kids today who seem constantly bored. The mid eighties brought my mates and I out first exploration into Home Computers, I remember Ian Ditchburn being the first to get a ZX80 the machine before the Sinclair zX81, I remember owning this machine and being amazed after spending hours typing a BASIC program that simply showed the time, and accidently knocking it and loosing everything. I managed to upgrade the internal memory from 1KB to 16Kb, and playing 3D Monster Chase which had to be loaded from tape. Shortly after I upgraded to the Sincalir Spectrum which was iconic machine but very basic at today’s standards, but it was amazing to us at the time with colour graphics and sound, its amazing to think that now I can play those same games on my phone. A lot time I spent cycling around the Deerness Valley I have fond memories a 10 speed Tensor Racer I had and the speed I managed to attain going along the College Road. I think I was always a “speed freak”, I recall the time when I was only a few years old and flew down Bannerman Hill on a tiny little toy car, only just stopping at the junction, just as well as I would have no doubt been splattered. I haven’t really stopped cycling, I regularly cycle along most of the disused railway paths in the county and especially along the Deerness Valley. Friends I remember from Ushaw Moor include Alan Dawson, Anthony Towers, Ian Ditchburn, Tony and Terry Nyland, Graham Seymour, Ian Stangroom with which we tended to be mucking about on Tarzan Swings in the College Woods. Anyway I better get some work done,, sorry for the short content , more next time,,,I hope this jogs some more memories for visitors. Before I continue with my memories of the village in the forties and fifties I have been looking at Kelly’s directory’s entries for Ushaw Moor up to 1938 when unfortunately they come to an end and I thought you might be interested in some of the entries connected with the businesses I have already mentioned. In 1902 Ushaw Colliery Post office was run by Mr. Frank Proctor , whose family came to have a close connection with the village in my time.The Russell family had the post office in 1910 and still had in the early sixties.The Bell family ran Cockhouse farm from 1902 with Mr. John Bell running the farm as bailiff to Pease and Partners who owned the colliery.Henry Watson,presumably the forerunner of Stan Watson’s,had a stationery shop in Station Road from 1902.Lizzie Hope established the fishop in Temperance Terrace by 1934 after first opening a grocer’s shop there.Joe and Fred Lowery,Fred Parkinson and Mr. Alderson were all in business by 1925 and Surtees,the greengrocer’s ,was operating as early as 1921.With regard to Joe and Fred I wonder if they took over the business of the well known local firm of Dimambro who had a shop in the village in 1914.I also noted that back in 1910 Richard Hope had “refreshment rooms” -any link to you Wilf? I got as far as the Club Hall in my previous account.Behind the club was the “Rec” where we used to pay football and cricket as teenagers.It was a case of using jackets as goalposts and then getting on with a game.When younger the appeal was the swings or the roundabout or the seesaw.There was also a “horse” which as far as I can remember never worked. The best item,however, was something which was basically a plank of wood with provision for seats with steel supports linked to a frame and it was worked by by 2 people,one at either end who forced the plank backwards and forwards through the air and at times it seemed as if it was about to take off.I don’t know what it was called -it was not a “shuggy boat” -all I know it was exciting.Children came from all parts of the village to play there.There was also a community hall in the grounds of the “Rec”.I seem to remember it was a green, wooden hut and I always link the “Over 60’s” with its use.Mr. and Mrs. Jones who lived in Oakridge Road were two prominent members.I never dreamt I would reach an age when I could have joined, but I suppose it is better than the alternative.However,all these facilities have now gone and replaced by a housing estate.I remember there were protests when the housing estate was first mooted but to no avail.It seems that the protests failed on a technical point.In my opinion they were justified as the basketball court which is now there is to me a poor substitute.We did like to play football on the Catholic school field which had proper goalposts but were usually chased off by each and every priest throughout the years I lived in the village,but we did live in hope we could get away with it! The “Rec” was separated from the Recreation Ground proper by a fence so you had to go back out and enter via Highfield Terrace.The first thing to note as you went through the gate were two hard court tennis courts which were overlooked by the community hall.You walked down past these to where the groundsman had his office.I remember two groundsmen,firstly Jackie Towns who I think lived opposite us in Hunter Avenue and then his successor Billy Ayre,father of Raymond and Valerie. Here you paid for the use of the tennis courts or for a round of putt or a game of bowls.In the late 50’s the bowling green was converted into grass tennis courts as at Wimbledon.Tennis was most popular at the time of the Wimbledon championships.They seemed to encourage people to get out and play.I usually played with friends Robert Clarkson,John Burke and Alan Grainger, but there was an older set consisting of my brother George,George Cowper, who went on to be mayor of Durham, Kenny Snaith, Duggie Dunn, Albert Whitfield, Greta Turnbull,Barbara Shuker and Audrey Wood.The girls who went to the grammar school were always the best turned out,dressed in their whites-Val Cook, Valerie Wilson, Gwen Lewis and Marion Mountain all come to mind..After a game we usually had a small bottle of Wood and Watson’s pop which was kept in the office.I can’t say we were brilliant players even though we imagined ourselves to be Lew Hoad or Ken Rosewall or Pancho Gonzales but we really enjoyed it.The summer of 1959 was one of the best on record and the tennis went on through September.The office was at the back of a large hut which also was the cricket pavilion with changing rooms.These were also used for football teams and were entered from the front.There was a ladder to the upper floor where the scorer sat and one of the minions,sometimes me,put the numbers out onto the scoreboard.John Hope,my next door neighbour in Hunter Avenue, was scorer for a while.Mention has already been made of the cricket team on this site but the players I remember best were Gordon Thompson, the professional, Alf Gillespie, George Graham,my cousin,big Frank Proctor and John Mcdermott , who I think modelled himself on Fiery Fred Trueman and really hurtled the ball down.The football team has also had extensive coverage on the site and suffice to say they had very good team for much of the time and drew big crowds in the post-war years.One fixture sticks in my mind when Sunderland “A” team came to play and I found my allegiance stretched.John McSeveny ,who played some games for the Suderland first team,played in the fixture.There is just one last thing to mention in this section and that is the grossly smelly gents’ toilet which was tucked away on the left as you looked down at the pitches.I am not surprised it has gone!